this letter refers to the article ‘Explosions spook foreigners’ by Hasan Ali (or at least the person covered behind this name) published on 5th of March 2008 in the Lahore edition of Daily Times. An article that was quite spooky itself – definitely spooked me more than any explosion I have heard of so far. I read it, once twice thrice, thought over it in lecture, my thoughts got carried away and I ended up on feeling the urge to make a comment on ‘freedom of press’ in Pakistan and related to that and especially to this article the issue on how we as foreigners see Pakistan. A long topic one could write a book about. Ill try to cut it down to a page. I have left Pakistan nearly half a year ago, have followed the internal developments after the Lal Masjid issue only via the international media and private internet-blogs. Only the second I found convenient. The international-media is preoccupied, for CNN Pakistan is just another Afghanistan, for European newspapers the only solution for Pakistan was Benazir Bhutto and after her death media started to loose interest in the whole issue again. Like that Pakistan stays unknown to most. A big responsibility to change that, to transport a clearer picture of this country outside its borders, lies with the local media, especially the printed press (and of course their web editions). The more professional the papers get, the more likely news agencies from abroad will use them as a source. Even local media may establish attention abroad and get readers via its online versions. For that the freedom of the press is essential in future. As long as newspapers and private TV channels stay critical the way I have observed them the last years, positive development of the country’s politics will be propelled ahead. But for that professionalism you must not take freedom too far. Whether ‘Peter Morrison’ quoted in the article exists or not I have no idea. 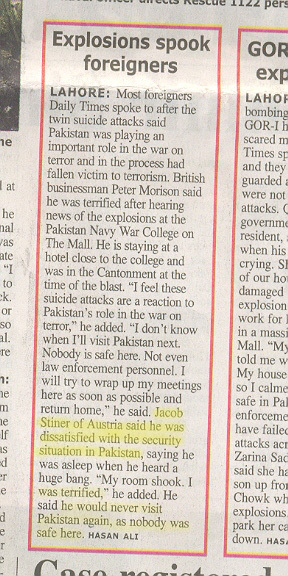 The second interviewed, ‘Jacob Stiner from Austria’ exists indeed – that would be me. But when the Navy College went up in smoke my bed didn’t shake. I was fast asleep – once round the globe in Switzerland. More importantly – I will return to Pakistan. You can count on that, whatever you write. I feel honored that myself (or was it just my name?) left such an impression on Pakistan’s media, but I do not wish to be used as a place holder for fake interviews to underline your own fear that everyone mistrusts you, dislikes this country and sees it solely as the roots of terror attacks in the West. I love Pakistan and some of its people (most of the ones I met) and I wish that more and more people will realize that its you as the people who make this country better or worse (and that includes the media men!) and not Gen. Pervaiz Musharraf alone! Seldom have I met foreigners who complained about feeling unsafe, or that everyone looked like a terrorist. Nonsense. When I rode my motorbike along Mall Road passing judges and police man throwing stones, I was rather annoyed by car drivers who blocked whole crossings because they wouldn’t wait for the green light to come and later complained that all this mess was Musharrafs fault. I have stayed in Islamabad F5 while Lal Masjid was riddled with bullets – but what angered me the most that day was an employee at my own embassy who didn’t want to let me in because for him I looked Afghani and thus I should get lost. If I will not return to Pakistan the reason will be that my visa will not be issued for reasons of (unfortunately typical) laziness and unreliability. But not for the sake of terrorism.